Teaching a dog to exercise self-control is at the heart of training successfully. At ClickerExpo 2016 in Reno, Nevada, and Cincinnati, Ohio, Karen Pryor Academy (KPA) and ClickerExpo faculty member Sarah Owings will be presenting several Sessions and Labs to help with this training. She will present strategies for teaching high-energy dogs the critical skills of calming, focusing, and impulse-control in the midst of high levels of distraction. For many high-energy dogs and their owners, the commotion of the holidays presents a range of challenges. 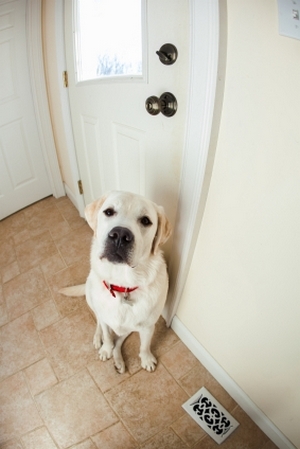 Here, Sarah offers a simple technique that you can teach your dog now to help prevent one of the most prevalent and dangerous problem behaviors during the holidays: door-dashing! Although there are many elegant solutions to door-dashing, such as teaching your dog to wait behind an invisible barrier, or go to his crate or bed and stay there when the doorbell rings, most people don't have extra time for elaborate training plans during the holidays. Luckily, the “Party in the Kitchen!” technique can be taught in just minutes a day. The party doesn't have to be in the kitchen. Any room adjacent to your entryway or living room will work well. January 22-24, 2016 or Cincinnati, OH, March 18-20, 2016. Attach a walk-through gate to the doorway of the “party” room or, if you have an open floor plan, hang an exercise pen from U-hooks attached to the walls or use a convertible pet gate to create a sturdy barrier between your dogs and the incoming guests. A week or two before any holiday get-togethers, begin to recondition your dogs to run away from the door instead of toward it when the bell rings. Ring the doorbell yourself (or have a family member stand outside and do it for you), announce “Party in the Kitchen!” and encourage your dogs to run with you into the secure area. Once the dogs arrive, scatter a bunch of high-value treats all over the floor to keep them occupied while you close the gate and pretend to open the front door. (If you have multiple dogs that guard food from each other, teach them to run to separate crates or pens instead, and scatter treats for them in the crates or pens once the doors are safely closed.) Repeat this exercise 3-5 times per day and, whenever possible, practice by asking friends and family to ring the bell at random times. After just a few days, what you should start to see is your dogs turning toward their safe room automatically when they hear the doorbell ring. They may still bark and get excited, but they should be much easier to redirect. On the big day, have high-value treats ready to go. When the time comes, be sure to pepper the floor with them so your dogs are really absorbed, happily and quietly snuffling around behind the gate, while you greet your guests. You can also gift each dog with a delicious stuffed Kong to unpack as guests arrive. If the dogs finish their prizes and start to bark, ignore them. As soon as they start to calm down, say “yes” or click, and toss another round of treats. Repeat until the dogs are completely calm and/or all guests have arrived. At that point, the dogs may be ready to join the gathering. Want more strategies for teaching calm, focused behavior? Join Sarah at ClickerExpo 2016 in Reno, Nevada, and Cincinnati, Ohio.